In order to encourage rehabilitation of building façades and streetscape improvements in the downtown business district, the Easton Main Street Initiative (EMSI) is able to use funds from the Pennsylvania Department of Community and Economic Development, Northampton County Department of Community and Economic Development, proceeds from the Historic Easton House Tour, and other resources to financially assist property and business owners in completing their projects. 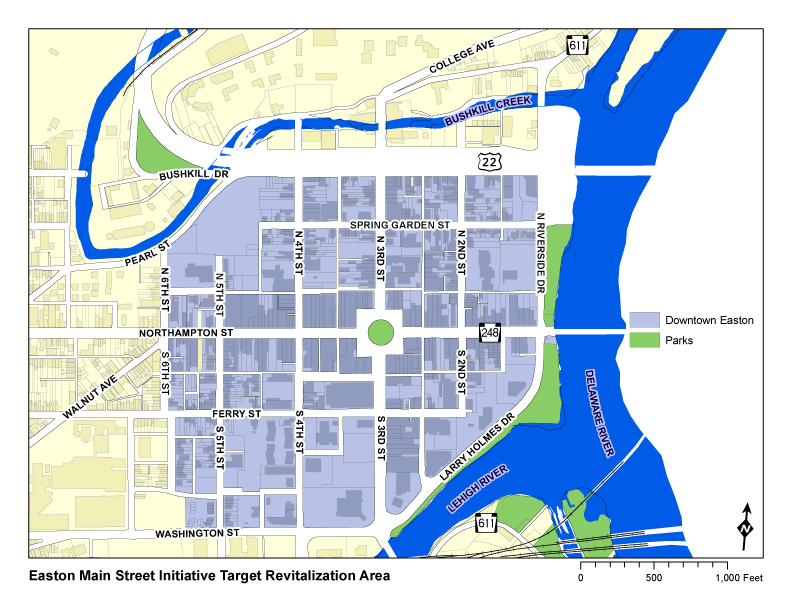 Eligible buildings must be located in the Main Street district which is indicated on the map below in blue. Most exterior improvements will be considered for the grant including paint, windows, repointing, doors, façade repair/ restoration, sidewalk improvements / replacement, and signage. In addition to physical improvements, professional design services are also eligible for assistance under this program. This grant program will reimburse property and business owners a fifty percent match of project costs up to $5,000. For example, if a project costs a total of $10,000, $5,000 will be reimbursed. Projects exceeding $10,000 will only be eligible for a maximum reimbursement of $5,000. Façade improvement projects exceeding $25,000 in cost are not eligible for this program. This grant program will reimburse property and business owners up to $500.00 for design fees related to a façade improvement project. This grant program will reimburse property and business owners a fifty percent match of signage costs up to $1,500. Sign projects that exceed $3,000 are only eligible for a maximum reimbursement of $1,500. This grant program will reimburse property and business owners a thirty-three percent match of sidewalk repair / replacement costs up to $3,000. Sidewalk projects that exceed $9,000 are only eligible for a maximum reimbursement of $3,000. All projects must be compliant with the standards set forth by City’s engineering department. A full set of guidelines, along with the Facade Grant Application can be downloaded HERE. **Please note our offices are located above the Easton Public Market, 325 Northampton Street, Easton. For in-person questions or to drop-off applications, please call the number listed below to set-up an appointment. If you are need in of additional assistance, please call Kim Kmetz at (610) 330-9940 or email kim@eastonpartnership.org.